A vibrant presentation doesnt save Sentris from a lack of depth or direction. What is it? A music performance/puzzle game. Playing Sentris, a block-based musical performance game, feels like playing with Legos, except there’s a grumpy man who rolls around every ten minutes to slap the back of my head and wordlessly point to a bust of Beethoven. 'You want me to make that?' I ask. No answer. Beethoven’s marble face is frowning. Every wrinkle is super pronounced and comic and horrifying. I’m frowning too. Sentris can be fun, but it pulls me in opposite directions. One is towards robust music creation and the other is towards simple musical play. The approaches work against each other; the creative tools are awkward and limited, and any experimental play is discouraged by boring puzzles and a dense, abstract interface. Sentris is neither a good music toy, nor a good music tool. It's like a Lego set that encourages you to build something great, but the blocks all have odd shapes, and don't look like they do on the box. You can either struggle to build a crappy Beethoven bust, or try to have fun with a bunch of blocks that are hard to fit together. Sentris is hard to grasp without playing it for a while, but the basic premise is simple. A circle spins in time with a song’s meter, its current rotation designated by lines that fall on each primary beat. Above the circle is an inventory of colored blocks that can be placed on the circle as it rotates. When these colored blocks pass through the top of the circle, their specific sound is played. The blocks can also be stacked on top of one another and rearranged along the circle timeline to (ideally) create music. If it sounds, abstract, it is. And it’s a pretty abstraction. Everything has a healthy glow and each block lights up in a pleasant burst as it’s played. There’s also a diverse selection of color palettes and backgrounds to choose from. I was most at ease in the bamboo forest or cyberpunk alleyway coupled with earthy-toned blocks. But Sentris is also visually busy. There’s too much going on right off the bat, and none of is it as intuitive as it strives to be. The visual language has a definite logic, it just wasn’t obvious without a frustrating thirty-minute decryption session to get things going—colors are assigned to instruments, scales are denoted by filled-in spaces on a honeycomb, selecting an empty space in your inventory will highlight and recall that specific sound, and so on. 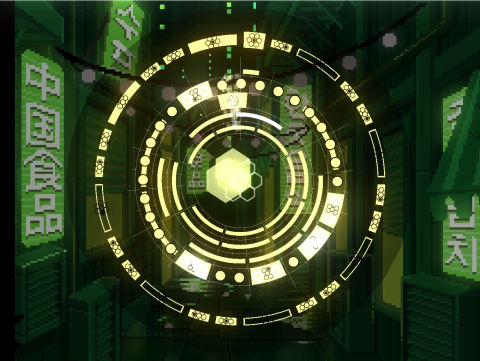 While Sentris is described as a musical performance game, a puzzle mode is the default method of play. On the rotating circle grid, colored dots will be arranged and the goal is to simply place a sound block with a corresponding color in that space. Unless things get crowded, it’s never difficult, so calling it a puzzle mode feels a bit disingenuine. The dots just function as signposts for those without a clue. If I followed each puzzle note, whatever I ended up creating was usually recognizable as musical, but never felt like my own. But the more I carefully considered crafting a loop in Sentris, the more I carefully considered what the hell I was doing with my time. I’m somewhat musically inclined—I can translate any hair metal guitar solo to tuba and ‘sing’ in relative tune to most of ABBA’s deeper cuts—so it’s not like I can’t keep a beat or recognize shades of musical intent, but Sentris just isn’t a good music creation tool. Most clips feel cheap and abrupt, like a kid banging on a toy keyboard programmed with animal sounds. Without a way to add effects or filters, even a carefully crafted loop ends up more staccato than it should. There’s also no way to mess with dynamics, so certain instruments will inevitably drown out others, often resulting in a harsh wall of noise. It isn’t impossible to make a loop that sounds nice, it just feels impossible to make one sound like I want it to. Especially because editing a loop favors those who can keep a super precise beat. Intentional experimentation with complex rhythm and placement was entirely up to my ability to time placing blocks on the circle as it rotated. There’s no way to freeze the loop to adjust sound placement for nuance; it always boils down to mundane repetition: waiting for the hopeful position to rotate back around, placing the block, screwing up, removing the block, and trying again. The loops I create are fleeting, lost unless I export every one. Once I did make a loop that I didn’t hate, the option to export a .wav file would often be impossible, simply because I’d completed the ‘puzzle’ (highlighted all the colored circles) on accident. I desperately wished there was an added layer—and I feel like the circle design would house it nicely—where I could assemble my favorite loops and create songs inside the game. Otherwise, the loops I create are fleeting, lost unless I export every one, and further, assembling each into something listenable can be a hassle without experience in audio editing. I’m sure there are folks out there who could make something pretty great with Sentris. I’m also sure they’d make something better in the same amount of time with better tools. Sentris includes options for key changes, switching out instrumentation, and an adjustable BPM, but the awkward editing tools restricted my musical aspirations. I'd have been better off playing around in a regular digital audio workstation. Sentris was still pleasant to experience, though. Decrypting its interface wasn’t fun, but I felt accomplished for puzzling out its alien aesthetic and created a few loops that emptied out my mind for a moment or two. That was nice and, overall, I didn't hate anything about it, but Sentris tries to be both a music creator and a music toy, and it just isn’t a great example of either. Maybe it's not a cyberpunk alleyway, but let me #believe. The circles are 'puzzle' dots. Place a yellow block on all of them to win. Thin lines represent blocks placed on a previous loop. The colors sure are nice. Bamboo forests are chill. Circles are pretty chill too, I guess. Where the honeycomb is filled in determines what sound each block makes. This was an attempt to teach me about scales.